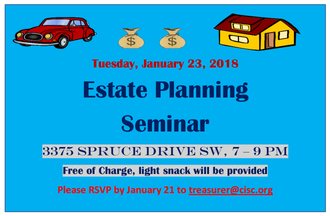 Please join us for CISC up coming estate planning seminar hosted by an estate planning specialist Christine Lang. She is a volunteer of CPA Canada’s Financial Literacy Program and will have your questions answered. Christine will be sharing her expertise on how to best protect your estate by preserving assets and minimizing taxes thus ensuring family harmony and peace of mind. You will learn the what and Why of Estate Planning and various tools of estate planning and estate planning process. Please mark this date, January 23rd, 2018, Tuesday at 7PM sharp. This event will be held at Bow Cliff Seniors Centre, 3375 Spruce Dr SW, Calgary, AB T3C 3A3. See poster for more details.